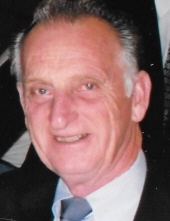 Larry J. Yetter, 86, died peacefully surrounded by his loving family in Littleton, CO, on February 7, 2019. A funeral mass will be held at All Souls Catholic Church in Englewood, CO, at 10:00 am on February 21st, with a Celebration of Life to follow at the Elks Lodge in Littleton, CO. Burial will take place at a future date with military honors at the North Dakota Veterans Cemetery in Mandan, ND. Larry Joseph Yetter was born November 7th, 1932, in Flasher, ND, near Mandan. Throughout his life he lived in many different locations. He enlisted in the US Navy a few days after his 18th birthday. He earned a Master of Science (Education) degree at the University of North Dakota in Grand Forks, ND, in 1969. He worked at various types of employment, including teaching at Bemidji State University in Bemidji, MN, and at Red River Community College in Winnipeg, Canada. He was a self-taught, skilled carpenter and cabinet maker, who enjoyed teaching others his skills. During his retirement, Larry enjoyed traveling with his beloved wife, working at his farm in Nebraska, and spending time with his many children and grandchildren. Favorite activities included hunting, building projects, and many trips and reunions. Larry was an avid reader and enjoyed learning about history, geography, and politics. He was passionately patriotic. He is survived by his wife of 64 years, Helen (Fischer) Yetter. Together they raised 6 children; Linda Lindseth, Greg (Cathy), Bret (Cindy), Jason (Lisa), Quint (Janine) and Jon (Tracy). His legacy includes 18 grandchildren and 9 great-grandchildren. He was fiercely dedicated to and protective of his family. He is also survived by one sister, Clara Heintzman, and numerous nieces, nephews, and in-laws. To send flowers or a remembrance gift to the family of Larry Joseph Yetter, please visit our Tribute Store. Celebration of Life reception to follow Mass at the Littleton Elks Lodge. Committal will be held later in the North Dakota Veteran's Cemetery, Mandan, North Dakota. "Email Address" would like to share the life celebration of Larry Joseph Yetter. Click on the "link" to go to share a favorite memory or leave a condolence message for the family.